While waiting for the trailer, or even some gameplay, here are some images of DOOM! Did someone tell Bethesda we are already a couple of years into the generation? First Fallout, and now this, games that are hardly worthy of this generation when it comes to graphics. Remember when DooM had good enemy design? Honestly this looks great. Not jaw dropping in any way. The stills does not make it justice. Have you seen the demo? Enemy design is true to the series and personally I think they've nailed it pretty well. Graphically it looks fantastic in motion and it feels like a big jump over idTech5. Big enough at least. Gameplay wise it looks awesome. I think the monsters look really great, all these details that you can see in those close-up shots... aah. It is close to Doom3 in lighting, art and architecture style. Think about Doom3's gameplay what you want, but I loved Doom3's graphics and the lighting in particular, it was a joy to see for a graphics enthusiast, during a time when everybody else was working with baked or even handdrawn lighting even on moving stuff, or with shadow maps that added darkness on top of each other when overlapping (from the SAME lightsource), and they were adding shadows (rendering as arbitrarily transparent dark textures) instead of removing the light from that one lightsource that would have been the right thing to do. Ofcourse Doom3's stencil shadows had only hard edges, representing point-lights and no bouncing, but under these limits it was physically perfect, and to my eyes that looked totally awesome and never-seen-before. I saw this video https://www.youtube.com/watch?v=xVaWl1GtDHU got interested alot! i don't know if it's the doom 3 aesthetic causing the issue. but it looks like a step backwards visually from the likes of rage? it litterally looks like a doom 3 mod? but still, it's doom. i'm looking forward to it, but it's not entirely what i expected. i was expecting a true return to roots and this doesn't quite seem like it is. Doesn't look good to me. 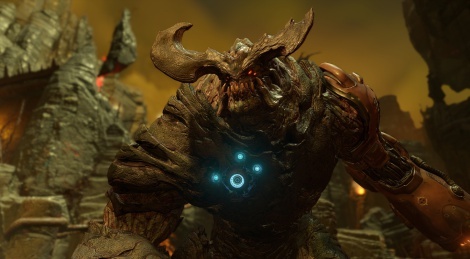 First 2 Doom games were good in the sense they were fun, even from graphics standpoint. The enemies were recognizible and not so overdetailed and blending into the environment. From these screenshots I can't recognize it from the contemporary generic shooters. Maybe the gameplay will save it. 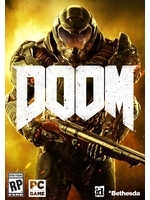 But still, it looks more like Doom3-2 which doesn't mean it's a bad thing if it's aimed at people who liked D3. EDIT: just watched a second gameplay video and in places it even looks like they've just re-used assets from doom 3 too. maybe that's what they're going for. a low risk sequel? if it's anything like their previous tech it'll run at 60fps. They're doing an evolution of the DooM3 asthetic with gameplay more similar with 1-2. The game looks good, it doesn't look dated, but I get what you're saying, the visual direction is very similar. Basically they used 3 as a visual template and built from there. it does look dated. it has some nice current gen effects and particles. but the world and geomentry is very typical tech4/5. it's all very soft looking with an emphesis on normal maps rather then modelled details. it's fine for what it is. but it does look incredibly old. but it's obvious the 60fps performance was their priority, not the graphics. which is fine. wolfenstein was fun as hell and had the same focus. that's still not doing much for me visually. it has a nice atmosphere don't get me wrong. but it's too soft and lacks detail (is the environment even textured lol). just like tech 5 did. it kinda looks a lot like some of the more atmospheric destiny areas, which i didnt find all that visually impressive either. looks very fun to play though so i'm sold. I wasn't blown away by the Doom reveal but I did not hate it either. Well, if they are smart, they will listen to the fan reactions because it seems to be universal that a lot of people don't hate it but they don't "love" it either. It's still nice to see the grandfather of FPS get out of his wheel chair tho'. some of it for me are picky things such as the way certain demon's have been designed or re-used from doom3. case in point being the hell knight. it was always such a poor reimagining of the original doom hell knight even in doom3. and they've straight up re-used the fucker here. there are just a few things they can do to really make this feel like the doom of old. while still keeping this new gameplay. and a lot of that is just design related. the way weapons and enemies look. the same complaints came up when doom 3 was announced too. they way they'd changed the imps. or the lost souls. or hell knights etc.. they rectified some of those things in the expansion, but seem to have forgotten them again for this new doom. unless of course they're purely serving as placeholder currently? Ive never seen doom as a fantastic graphics game anyway it does not seem the type of game where the dev goes all out on graphics.